Safety is always our number one priority. 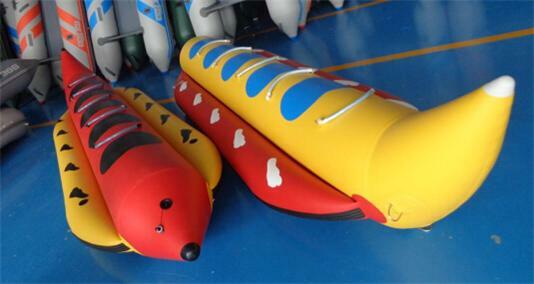 Our Banana boats are the most popular banana boats in Hong Kong and we have supplied these all over the world. Most holiday spots in Asia use our banana boats, flybird riders and other towable toys. Through out the years we have tried, tested and made improvements to the design, angle, structure to ensure that it is totally safe and fun thing to use. The Material used is PVC of high grade no.1100D, the thickness of material is 0.9mm, highly reliable and made to be used frequently and designed to last long.The dense weave Polyester fabric base layer provides strength on both sides of the PVC layers. The PVC is dipped in protective coatings to ensure protection of Oil, and protection from UV radiation and abrasion. The best operating temperatures are from 35C to 65C. The Banana boats we do coming in 3 sizes. for 3 persons, 4 persons and 5 persons. There can be longer ones made upon request but generally its easy to be out of balance and there is more bending when the banana boat or a towable toy is too long. 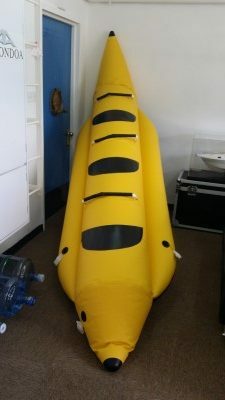 Pictures of the Banana Boats with different color variations.